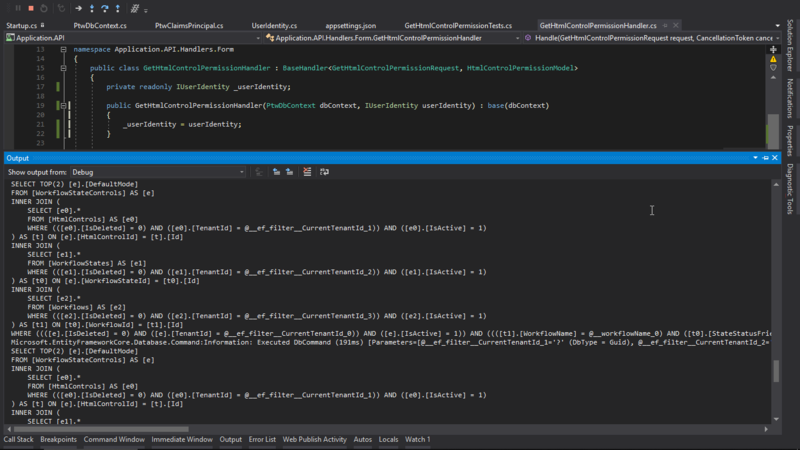 How do I view the SQL generated by entity framework ? That will give you the SQL that was generated. For those using Entity Framework 6 and up, if you want to view the output SQL in Visual Studio (like I did) you have to use the new logging/interception functionality. // query the database using EF here. Note: Make sure you are running your project in DEBUG mode. Applicable for EF 6.0 and above: For those of you wanting to know more about the logging functionality and adding to the some of the answers already given. - Queries, including normal LINQ queries, eSQL queries, and raw queries from methods such as SqlQuery. - The approximate amount of time it took to execute the command. Note that this is the time from sending the command to getting the result object back. It does not include time to read the results. To view the SQL that will be generated, simply call ToTraceString(). You can add it into your watch window and set a breakpoint to see what the query would be at any given point for any LINQ query. You can attach a tracer to your SQL server of choice, which will show you the final query in all its gory detail. In the case of MySQL, the easiest way to trace the queries is simply to tail the query log with tail -f. You can learn more about MySQL's logging facilities in the official documentation. For SQL Server, the easiest way is to use the included SQL Server profiler. This Complex case avoids overriding the DbContext OnConfiguring method. , which is discouraged in the docs: "This approach does not lend itself to testing, unless the tests target the full database." To have the query always handy, without changing code add this to your DbContext and check it on the output window in visual studio. Similar to @Matt Nibecker answer, but with this you do not have to add it in your current code, every time you need the query. .UseSqlServer("my connection string") //"Server=. ;Initial Catalog=TestDb;Integrated Security=True"
Of course your anonymous type signature might be different. If you want to have parameter values (not only @p_linq_0 but also their values) too, you can use IDbCommandInterceptor and add some logging to ReaderExecuted method. Start that profile running then trigger the query. Not the answer you're looking for? Browse other questions tagged entity-framework ado.net or ask your own question. How to view LINQ Generated SQL statements? Get SQL query from LINQ to SQL?